The £20 notes were always my favourite denomination, especially the older ones. 1945 is a very rare year for the £20 note, with only three dates. Has anyone seen any of the other 1945 dates? 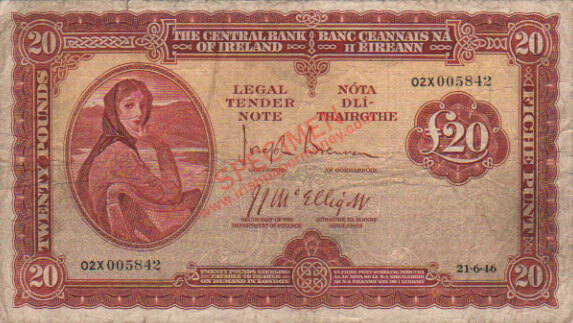 On irishpapermoney.com the list of recorded dates is growing, slowly. The £1 notes were completed a couple of years ago, but the other denominations have gaps. The goal is to have an image of every date. I've been looking for one of those for a long time! Several 1943 War code 20 Pound notes have turned up over the years. 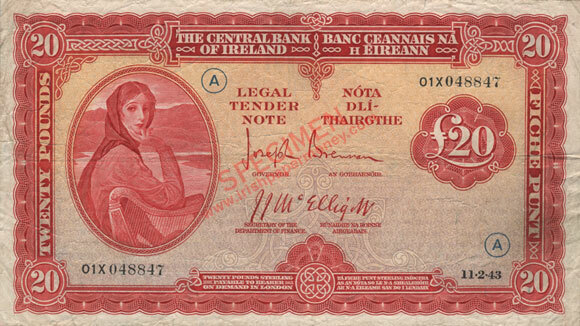 1943 Irish Twenty Pound note. War code Twenty. 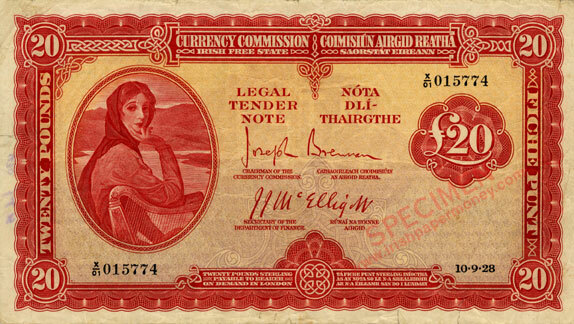 The original Currency Commission Twenty Pound note also bore the signatures of Brennan and Mc Elligott. There was only one date, 10.9.28 for this Type note. 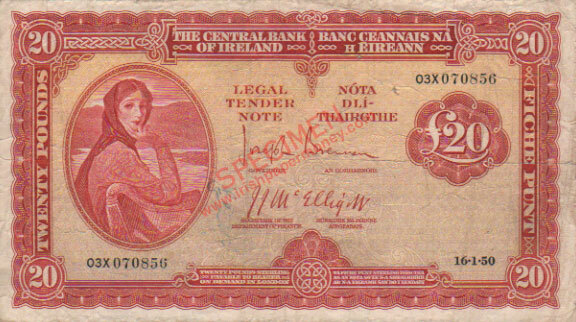 Lavery 1928 Twenty Pound note. 1946 £20. Prefix 02X. Although not as rare as 1945, 1946-1948 £20 notes are still tough notes to obtain in any grade. In the date listings of Lavery £20 notes there are still many gaps in 1947 and 1948, though I've recorded most of the 1946 dates—just lucky there! 1947 £20 note. This is one of the better examples I have seen. Older pre-1950 Twenty Pound notes are difficult to find without some kind of graffiti on them! 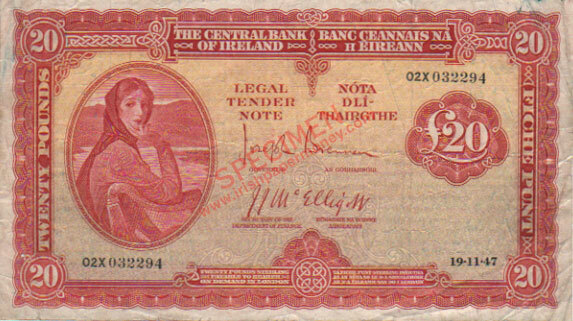 Here's the nicest Lavery 1948 Twenty Pound note I have seen. There are a reasonable number of 1948 £20 notes out there, though the same dates keep turning up! Haven't added a date in several years. Still a scarce note though. 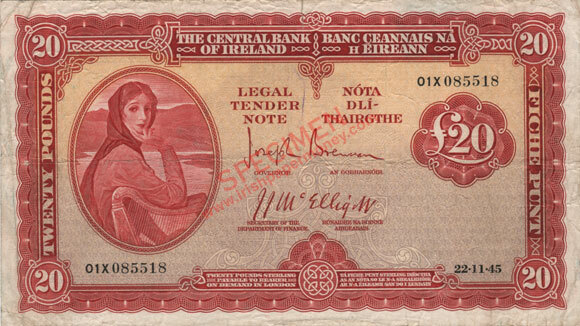 Here is a nice 1949 Irish 20 Pound note, an unused gVF. 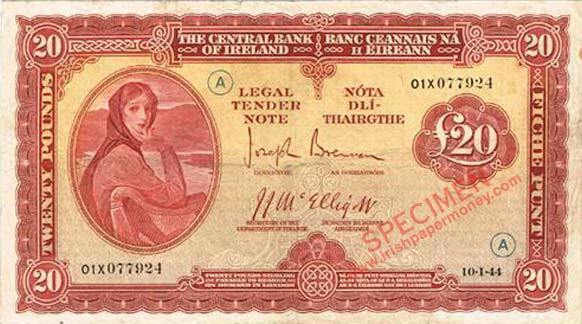 From 1949 onwards the printage figures increased, the notes also tend to be obtainable in better grades, and there are more of them out there. Still a scarce note, in that they are not readily available. And while we're at it, here's a 1950 £20. A 1944 £20 note finally turned up recently. Quite a presentable note too. This 1951 £20 turned up recently on ebay. Hey i saw that one on eBay. he wanted a crazy price for it, wasn’t up for negotiation either. If one of these was cleaned, would it command a premium? Why would a cleaned note command a premium?! 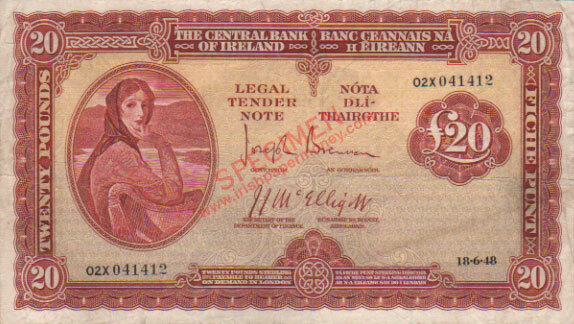 Cleaning reduces the value of a note as well as damaging its structure. They are to be avoided. Scarce notes still command premiums when cleaned, in my experience. Would this? In my experience grade is what matters most. Cleaning makes a note low grade. Many collectors would not want to have cleaned notes in their collection. 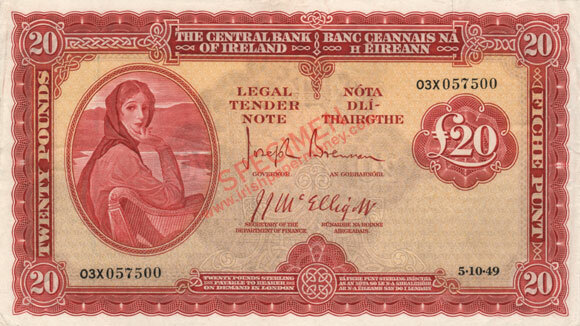 A dealer would not pay a premium for a cleaned note, most dealers would use the fact of the note being cleaned as a reason to offer less. Some dealers will not buy cleaned notes at all. Besides, only a cretin would clean a scarce note. Sometimes the cleaning is too harsh and damages the note, there's a thread on it somewhere in the forum.